Dry skin care doesn’t have to pop-up in your mind, just when the winter is around. It is also caused due to various factors like your genetic disposition, age, nutritional deficiencies, and lifestyle. Surprisingly, dry skin can occur due to the usage of household products like detergents, cleaning agents or even air fresheners as per WebMD. The condition of dry skin looks and feels flaky; is uncomfortable, itchy and cracking. Apart from the discomfort it brings, it also makes you feel conscious of your appearance. And that selfie goes for a toss! Whatever the reasons for your dry skin are, rejoice there is always a home remedy! They work on your skin as good as a grandmother’s food recipe. Change begins at home, and so do remedies for dry skin! Petroleum jelly: A go-to product for all skin types, including Sensitive skin. Petroleum jelly is gentle on skin, as it does not contain many chemicals that could further worsen your skin condition. You can apply it as often as you like, even on your lips. Ghee: This do-gooder isn’t just the essential fat your body needs, but is an all-rounder when it comes to treating it’s inside and outside. Apply pure ghee in slow and circular motion on your face and affected areas of the body, for a few hours pre-shower. Coconut Oil: Yes, coconut oil that is normally believed to grow your body hair if applied is a myth! If anything, the oil that adorns your shelves helps lock-in and replenish moisture in your skin. Apply on dry areas and leave it in. Maintain: While you could have as many quick fixes for dry skin care, as you like and afford, it is always smart to ensure taking care of your condition is not just skin-deep. Your diet could make all the difference, as food affects you at the cellular level. A regular intake of foods rich in Omega 3 fatty acids – found in fish and flax seeds, Vitamin A contained in Sweet Potatoes & Vitamin E in Nuts and anti-oxidants available in fruits and vegetables are highly recommended! All of this, while you guzzle down the required amount of water, to keep yourself hydrated. Prevent: As the old adage goes, “prevention is better than cure,” a few lifestyle changes can topple dry skin. Avoid taking long hot showers, and stick to luke-warm water, as it is just right to remove dirt and excessive oiliness. Protect yourself with rubber gloves, while you are at scrubbing your house or doing the laundry. If you are up for a swim, make sure to take a shower afterward with a mild soap. Acne treatment is best handled by Clove Oil. Monsoons arrive and shower upon us a Rainbow mood, as we bid goodbye to the sultry summers. But along with the rains, comes a necessity to care for skin more, as the season makes us prone to bacterial and fungal infections. We go about waging wars with the skin breakouts, using one anti-acne product after another, which sometimes work and at other times leave us to no avail. But little did we know that we have the hidden gem of solution in the form of Clove Oil. Yes, that too it such an all natural pimple treatment. Clove oil is available to us at our homes within a hands reach, or just a hop, skip and jump away at the supermarket nearby. The instant availability makes it a hero, so does its solid anti-bacterial property when it comes to acne. Not just that, it is also utilized to treat various health conditions like toothaches, asthma, indigestion, headaches, stress, owing to its anti-fungal, antiseptic, antiviral properties. We are talking about a champion here, read on to know how to use it for your acne woes. 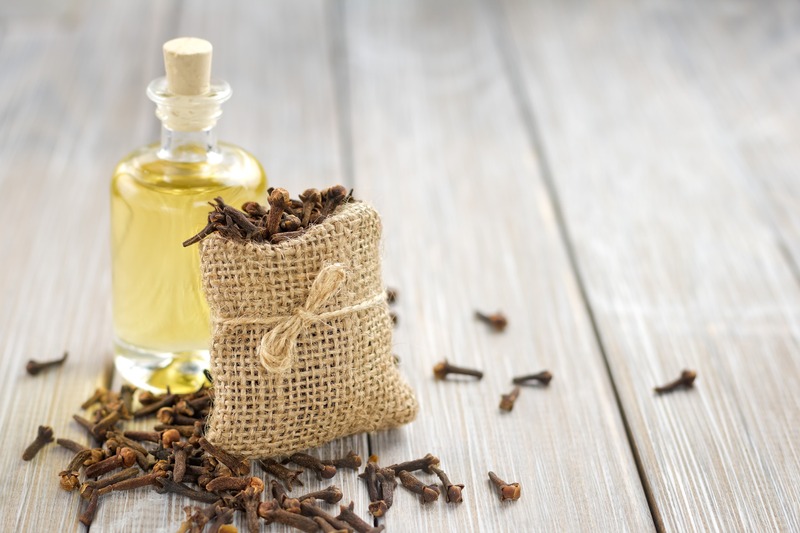 Clove oil is derived from dried clove buds, which has a pale yellow colour and an arresting spicy aroma. Over the time, American universities have stated again and again of how it is a tough fighter when it comes to pimples causing bacteria. However, since it carries in it such a powerful quality, you got to opt to dilute it with other substances, especially those with sensitive skin. Clove Oil and Coconut Oil: Mix Clove oil and pure coconut oil in the ratio of 1:10, apply it to affected area on your face for 15 minutes and wash off. You can also use Olive Oil instead of coconut oil too. Clove Oil and Egg: Apply a mixture of egg yolk and a few drops of Clove oil on acne, till it dries and wash it off with lukewarm water. Clove Oil and Moisturising Lotion: Good news is you can also use a few drops of Clove oil in your moisturizer. Although all the remedies involve diluting clove oil, with other ingredients, do not leave the mixture for long, wash it after prescribed time and pat it dry with a soft cloth. For those who have sensitive skin, it is recommended to do a patch test using Clove Oil on either hands or other body areas before you use it on your facial skin. If a certain remedy leads to any skin trouble, please discontinue and consult a dermatologist immediately.